The Dodge Daytona was a front-wheel drive hatchback based on the Chrysler G platform, which was derived from the Chrysler K platform. The Daytona was produced from 1984 to 1993. The Chrysler Laser was an upscale near twin version of the Daytona. The Daytona was restyled for 1987, and again for 1992. It replaced the Mitsubishi-based Challenger, and slotted between the Charger and the Conquest. The Daytona was replaced by the 1995 Dodge Avenger, which was built by Mitsubishi Motors. The Daytona derives its name mainly from the Dodge Charger Daytona, which itself was named after the Daytona 500 race in Daytona Beach, Florida. The Daytona originally used the 2.2 L Chrysler K engine in normally-aspirated (93 hp) or turbocharged (142 hp) form. The 96 hp 2.5 L K engine was added for 1986. In 1985, the 2.2 L Turbo I engine's horsepower was increased to 146 hp (109 kW). The 1984 Daytona was available in three trim lines: standard, Turbo and Turbo Z. Total production was 49,347. The Daytona Turbo was on Car and Driver magazine's Ten Best list for 1984. Both the Daytona and Chrysler Laser were available with the Chrysler Electronic Voice Alert system through 1987. A performance oriented "Shelby" version of the Daytona was introduced in 1987. The Chrysler Laser was Chrysler's attempt at creating a sporty car to expand their upscale brand lineup. 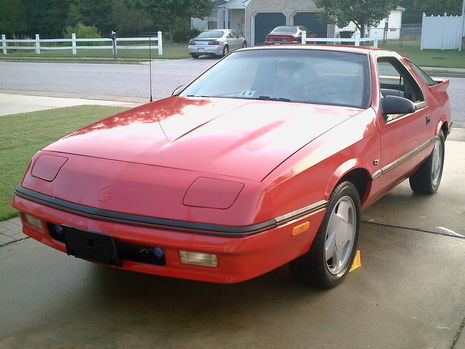 The Laser was a virtual clone of the Dodge Daytona. It was produced from 1984 to 1986. The only differences were limited to cosmetics, such as spoilers, side skirts and air dams, and the use of a digital instrument cluster in the XE trim. The 1984 Laser was available in two trim lines: standard and XE. In mid-1985, the XT trim was added as the top-of-the-line version. The standard, XE and XT trim lines would continue until the Laser’s demise in mid-1986. After 1986, the Daytona was exported to Canada as the Chrysler Daytona, officially ending Canadian Daytona sales under the Dodge marque. The turbo version of the Laser could be recognized by its use of black hood louvers. The 2.2 L Turbo I engine was available as standard equipment in the XE and XT trim lines and optional on the standard model. 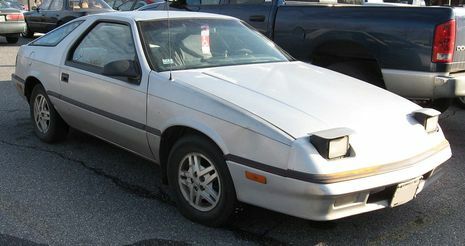 The Daytona and Laser were intended to replace the Chrysler Conquest, a rear wheel drive vehicle which competed directly against the Toyota Celica Supra. The Laser name was silently terminated after the first half of 1986 model year, then resurrected for the 1989/1990 model year with a new Plymouth Laser, built by Diamond Star Motors, a joint venture between Chrysler and Mitsubishi. The rebranded Laser shared its chassis with the Eagle Talon and Mitsubishi Eclipse. In 1987, the Chrysler LeBaron was restyled as a more proper sports car, removing Chrysler's need for the Laser. However, the Laser’s luxury performance image would be carried over into the 1987 Dodge Daytona Pacifica as well as the Lancer Pacifica and other Chrysler vehicles styled by Chrysler's Pacifica Studios. The Laser was specified to have an estimated 22 mpg city/35 mpg highway fuel mileage. Chrysler offered a 5 year or 50,000-mile (80,000 km) warranty, or a Protection Plan with outer body rust-through protection, based on United States Automobile Club tests. Mark Cross leather seats and a six-way power options were available as options. 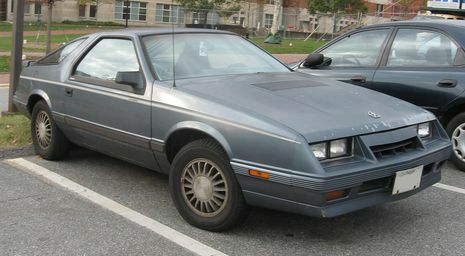 The Daytona first debuted from Dodge in 1984 along with its look alike, the Chrysler Laser. Design was based mostly on the K-cars (Reliant and Aries), and retained the fuel efficient 2.2 liter 4 cylinder engine. The Daytona was mounted on an extended K-frame and had front wheel drive. The Daytona has always been a 3 door 4 seater, but the rear seats are very small and it should really be considered a 2 seater for all practical purposes, with its small 97" wheel base. These cars are known as 'G' cars because their body style was designated G (later, AG). Stock performance with the 2.2 was not up to the Daytona’s looks, but it was produced as an economy car and Dodge relied on the turbo versions and sporty looks to attract younger drivers; few automakers made a fast, affordable sporty car at the time. The Laser was aimed at older drivers who appreciated a plusher vehicle, and with luxury options. In both cases the five-speed stick-shift provided a substantail speed and gas mileage boost. As Dodge pointed out, the Daytona was the first American-made front-drive sports car with a turbocharged engine. These were also some of the first cars to really make use of computer aided design technology (CAD). The car first debuted as the prototype G-24 Super Sports Car in 1982-83. If you look real close and squint a little you can see remnants of body styling from the 1969 Charger Daytona that swept NASCAR. The original Daytona models had a length of 175 inches on a 97 inch wheelbase, a width of 69 inches, and a height of 50 inches. Lotus’ Michael Royce wrote that Lotus Engineering had been contracted (in 1985) to engineer not only the Turbo III variant of the 2.2 liter engine (used in the Daytona R/T), but also a naturally aspirated 16 valve 2.5 liter engine and a four wheel drive Daytona Turbo. In the fall of 1986, the 2.5L NA Program was cancelled due to engineering budget constraints. The unusual combination of a long stroke (104 mm) with the 16 valve head fixed the 2.5L's breathing problems, and gave a nice smooth engine that would rev easily up to about 7500 rpm. It gave about the same performance in a vehicle as a Turbo I. The 4WD G-24 program was cancelled in November 1987, again due to budget constraints, just as we were getting the car to perform and handle as well as the Audi Quattro, the target vehicle. John Miles, from Lotus, was leading the chassis development. 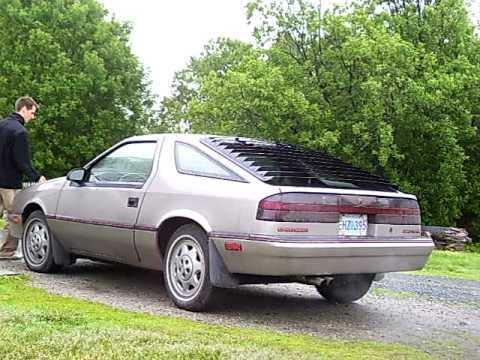 Bob O’Neill noted that the side louvers were made of ABS plastic, while the rear deck louvers were powder-coated aluminum (his own 1986 Turbo Z with T-tops came with the rear louvers, but not the side louvers).